Ergonomically designed to give people with gripping difficulties and limited wrist range of motion more confidence at the table. 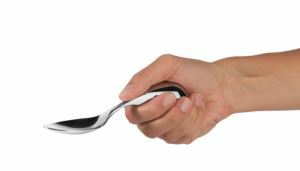 Integral is a cutlery set specifically developed for people with gripping difficulties and limited wrist range of motion. The aesthetic appearance and proven functionality allow users to eat independently and makes the everyday pleasures of good food even more enjoyable. Designer Isabel Heubl developed Integral with great empathy after extensive studies into the circumstances and lifestyle of people with gripping difficulties. Integral combines exceptional design with outstanding functionality. 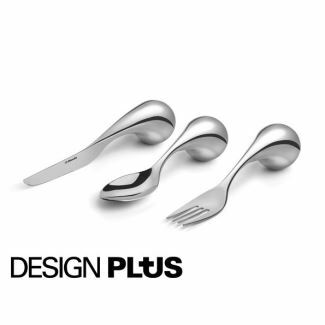 The elegant, graceful design is based on classical cutlery shapes and therefore emphasizes the normality of cutlery with only a slightly special appearance. Integral is an addition to the Amefa cutlery series and is produced from the finest quality 18/10 stainless steel, which ensures durability, a beautiful shine and a lasting performance. Integral is dishwasher safe. The bullet shaped handle fits perfectly into the palm of the hand and makes it easy to hold. 1. The flattened top of the blade makes it easier to apply pressure when cutting. 2. The lean transition from handle to bowl allows you to hold it in various positions. 3. The light curve at the edge of the blade allows a rocking motion when cutting. 4. 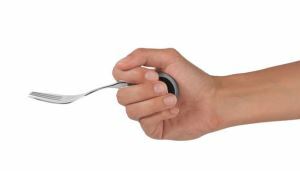 The elevated handle makes it easy to pick up the cutlery from flat surfaces. 5. 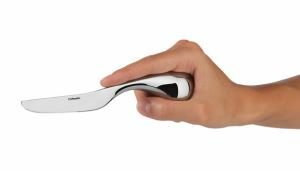 The flattened bottom of the handle ensures the cutlery stays put.